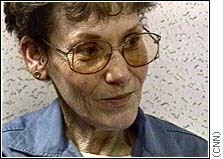 1998 Florida Execution of Judy Buenoano | can i just finish my waffle? I saw this story recently on Forensic Files or some such program. Despite the bizarre set of facts and that this took place in Florida, I didn’t remember anything at all about it. So I made a mental note to find out more about the case when I had the time. Now that the election is over, this was a welcome change of subject, unpleasant as it may be. Information is kind of sketchy. Where is Ann Rule when you need her? But I guess there’s no one left to interview. Beginning at the end of the story, fifty-four-year-old Judy Buenoano, known as the “Black Widow,” was executed in Florida’s electric chair Monday, March 13, 1998, for poisoning her husband in 1971. At the time, she was the first woman executed in Florida since 1848. This woman was a piece of work. Her deception began to unravel in 1983, when her fiance, John Gentry survived a car bombing attack in downtown Pensacola. He survived — and Judy had a problem. During the investigation of the bombing, Gentry told police that Judy had been giving him “vitamins” that made him sick, later discovered to contain arsenic and formaldehyde. 1. In 1971, she was married to James Goodyear (1934-1971), a sergeant in the USAF. According to prosecutors, she was motivated by insurance money when she poisoned him with lethal doses of arsenic. However, his death was initially believed to be due to natural causes. 2. In 1973, she moved in with Bobby Joe Morris in January of 1978, he succumbed. Later that year, she legally changed her name to “Buenoano” (Spanish for “good year”). 3. This is the most chilling. Judy’s son Michael Goodyear became severely ill in 1979, his symptoms including paraplegia. Post-mortem examination indicated that he had been the victim of severe arsenic poisoning, which caused his disability. But in 1980, she took Michael out for a little canoe ride, the canoe rolled over, and Michael, weighed down by his arm and leg braces, drowned. 4. Then comes the car bombing of fiance John Gentry. When the vitamins she had been giving him turned out to contain arsenic and formaldehyde, this led to the exhumation of the aforementioned James Goodyear, Michael Goodyear, and Bobby Joe Morris. Each of them had been the victim of arsenic poisoning. 5. She was also suspected in the 1980 death of her boyfriend Gerald Dossett. After her arrest, Dossett’s body was exhumed and analysed for signs of arsenic poisoning. No charges were laid in that case. She was sentenced to 12 years in prison for the car bombing, and Gentry’s story about the vitamins led investigators to uncover a series of crimes against her family. In 1984, a jury convicted Buenoano of killing her partially paralyzed 19-year-old son, Michael Goodyear, and sentenced her to life in prison. Prosecutors say she gave four different versions of what happened, but that she pushed him out of a canoe near Pensacola’s East River in 1980. She received the death penalty for the murder of her husband, James Goodyear. Her 13 years on Florida’s death row were spent writing letters, crocheting blankets and baby clothes, and maintaining her innocence. i believe the show was “The New Detectives”. how a mother could poison her son for years and then take him out in a canoe to drown him is despicable. I have seen this show on “women Who Kill” on Investigation Discovery. fyi. She Also Shrivelled the hands of one of her victims, and killed her lover, James Edgar Goodyear, to get her inheritance which was a whopping $500,000!! now i would use the expression i would kill for that money! but of course i wouldn’t and especially after reading her courtcase! hey Metal, i take it you also lived in Whisper Bay. Yep i knew them also along with one of James’ best friends Barry, we all use to hang out at Tiffany’s on the beach in the summer and down at Sin City during the winter. If you are who i think you may be, there was a group of artistic brothers that lived down the road from James, one of them did a portrait of the band Kiss and it was autographed by the band, the youngest one of the brothers had a big white rat as a pet. Yes i also agree her son and daughter were good kids and i knew it was wrong when they arrested James in Escambia County. Anyway i just had to comment, because with your name being Metal i just had a feeling you may be one of those brothers that i knew. @ Metal- I saw the documentary on Judy and from the moment her mother died when Judy was only 2 her whole life was tragic. Judy’s dad remarried a bad wicked, evil woman who beat and mistreated Judy; WHERE WAS JUDYS father when this was happening? Her stepmother should have been put away in prison for what she did to Judy. Of course this is no reason for Judy to have poisoned her husband and son, but our society and family is deteriorating forming criminals who had nobody to love them. In turn, they become not loving and violent even to their own families. To sum it up, because Judy had nobody who cared about her at all what do you expect to happen? She didn’t even stand a chance @ life. I don’t doubt that you knew the family and I came across this case just recently reading the story. I’d really love to hear more about this. For example, what happened to Kim and James after all this happened?. Did Mr. Gentry do drugs or was he being honest when he said the pot was for James?. And did she really kill her own son Michael?. You can message me at anytime on Facebook I’m under Cassie Harris. Or email me at cassandradawn770@gmail.com. thank you and have a good day!!! AND TO THINK THAT CASEY ANTHONY’S DEFENSE IS TRYING TO HAVE THE DP THROWN OFF THE TABLE. THIS GIRL DESERVES NOTHING ELSE BUT THE DP AND THERE SHOULD BE NO OTHER OPTION AS FAR AS SHE IS CONCERNED. THAT TEAM IS SICKENING TO THE POINT THAT I HATE SEEING THEM IN THE MEDIA. SHE KILLED HER CHILD AND WENT ON WITH HER LIFE AS IF SHE DID NOTHING WRONG. SO I SAY, STRAP HER AZZ IN THE CHAIR AND TURN ON THE JUICE. I AGREE 100%. HER VICTIMS HAD NO ONE TO DEFEND THEM FROM THIS MONSTER. I WOULD GO A BIT FARTHER WITH HER SENTENCE AND SENTENCE HER WITH YEARS OF ARSENIC POISENING UNTIL SHE IS PARALIZED HESELF AND THEN STRAP HER AZZ TO THE CHAIR AND TURN ON THE JUCIE. OR JUST TAKE HER ON A CANEO RIDE AND KICK HER IN THE AZZ UNTIL SHE GOES OVERBOARD! My name is Debbie Sims and Judy and her husband Jim were my foster parents in Orlando Florida when I was twelve until I was fifteen. I was there in her home when Jim returned from his tour of duty overseas. I was there when he was suffering because of the arsenic (at which time I knew nothing of but knew something wasn;t right!!!). She was reluctant to take him to the hospital for a long time and right there told me something was very wrong. Anyway I know that that was a long time ago but I have Lupus now and I am wondering if some of that arsenic got to me. She only gave it to those who she had an insurance policy on and the detectives etc. showed me a policy she had on me in the name of Debbie Goodyear. The Lupus symptoms were there for many years with the loss of hair and removal of gallbladder at very young age and also extreme nervousness. I have always considered the fact that she tried to poison me but just didn’t have enough time after her husband came home and she poisoned him. Why else would she have had the policy on me? If anyone out there has any type knowledge if arsenic can cause Lupus will you please contact me!!! I’m hoping you might drop me a line. I’ve been doing research into the Buenoano story for a TV true crime doc series and would really appreciate the opportunity to chat with you. I’m so sorry to hear of the pain that you’ve been through over the years. I’m sure you’re tired of talking about the case, but I’m doing a little research and was wondering if you’re interested in talking about it? If so, please email me at marz.producer@gmail.com. Debbie Sims, The same lupus Kim has? I was related to James Goodyear and I am still saddened to this day as to what happened to him. She deserved to die, he did not. I realize this is a longshot, but are you at all interested in speaking about your relationship with Judy and James? I’m doing research on the case for a new series and would love to chat with you. We have yet to find family members of the deceased and I really feel that they deserve a voice. Sorry to hear of your suffering. Lupus is a nasty disease. If you haven’t been advised by your own doctor, heavy metal poisoning (such as you are concerned about in this case with Arsenic) remains in the body for life (unless you have had specific treatment for heavy metal poisoning). Some simple tests should be able to rule in or out heavy metal poisoning. I just came across this page. I was growing up in Illinois when I heard this story but god its chilling what this woman did to her son and husband. Of all people mothers are generally seen as the protectors, but all that for money and then have the nerve to say ‘Im innocent!’. As she was in the imminent cells and when being escorted to the chair to face 2,000 volts of justice as one phrase I heard describing old sparky, I wonder if she realised the evilness of what she done as she saw the chair and no calls from the Governor to spare her. I think the words nasty and evil dont even hold a torch to what she did. I truly do hope her victims are resting in eternal peace. I read a book about this case several years ago…fascinating and sad. The poisonings and bombing were bad enough, but when reading of how she took Michael out in the canoe and allowed him to die, it just chilled me to the bone. It’s reminiscent somewhat of that old 1940’s film “Leave Her To Heaven” starring Gene Tierney. Tierney played a cold, calculating, self-absorbed, sociopathic type who took her husband’s younger brother ( who had polio and of whom she was jealous) out on a canoe ride and watched him as he drowned, not offering help, but somehow actually enjoying the evil…chilling.. The prosecuting attorney in this case:Belvin Perry, Jr. He is now the Chief Judge for the Ninth Judicial Circuit Court of Florida. He is now presiding judge for State of Florida vs. Casey Anthony. I did not know that. Thanks so much for the tip. I love it when I find a common thread that attaches stories together. My friend (who later became sheriff of the county) investigated the ‘accidental drowning’ of Judy’s son in the river a few miles from my home. When she was arrested for the car bombing in Pensacola, FL the drowning of her son became a topic of conversation by the locals…and especially my friend, the lead investigator. He told me that Judy’s story of an outing that turned tragic made sense at the time. She told him that the canoe accidently turned over and she could not save her son. Closed case…until the bombing. My aunt was the deputy clerk of the courts and was in the court room daily when Judy was on trial for the death of her son. She was in charge of the evidence and had the braces from the victim behind her on a desk for many months. Judy was definitely a ‘black widow’. Very interesting from those involved in the case. Thanks. I just saw her profiled on an episode of Deadly Women on the Investigation HD channel. Chilling is right. Just plain evil and got what she had coming. It’s a shame it took 13 years to do as lawyers and judges screw up the swift and sure punishment that our American system was once based on for their own greedy profit. Iam the former death row sergeant of this inmate as well as Ilean wornos. They were both evil. They were disspicable excuses for humans. But, most of them, on the row or not, are. Her son was born with paraplegia it wasn’t because of the arsenic that he was half crippled. No he was not, I was his best friend………. I’ve been posting and researching to find more voices from friends and family. Would you be interested in speaking with me briefly to tell your story? I really feel that they deserve a voice. To my knowledge, the U.S. Army doesn’t recruit paraplegics. He was given a medical discharge from the U.S. Army. He was drowned the very day he returned home! She didn’t even want him to have a single day back home! “See you later, fellas! I have to hurry home to get killed by my mother!” She was a walking slaughterhouse! She got what she deserved! Judy owned The Total Look nail salon where I got my nails done. We all knew something was wrong with her even to discussing her causing Michael’s “accident” and the death of her boyfriend. I remember her driving up in a new Corvett and saying she bought it with his insurance money. She was also supplying “vitamins” to her shop manager, a young lady with no relatives. My brother-in-law was a Sargent on the Pensacola PD. He told my sister and I, rather emphatically, to find another shop and to stay away from the Total Look. I wonder how it all started. Did she kill others before she killed her husband? It’s hard to believe she had not done this before. Could she have done this to other family members or foster children? A very sad and tragic story all the way around. Judge flips out after getting flipped off! John Gentry was my uncle and our whole family lived this mess for years!! Those saying that her children didn’t know what was going on….please check your facts. Maybe y’all didn’t know them as well as you think. The man who was killed in Brewton, AL in 1974 in a motel was my father. He was the only man killed in Brewton that year, in a motel, from Florida. For years I have wondered who killed him and why. I know I’ll never find out, but it is somewhat comforting to have, at the very least, this lead since the Brewton authorities couldn’t tell me anything. I am so sorry for your loss and for not having closure or answers. I can tell you that Judy was a lying manipulative piece of work and the world is better off without her in it. I was a young teen when she got to my uncle. Her other kills were for money. I hope one day you have more answers. Hi. I’m sorry I didn’t see this until now. John was my Uncle…my father’s brother. We called him Uncle Mike. Lucille was my grandmother. I didn’t know that Grandma Gentry had a sister named Leila! How fascinating. We’ve been working on a huge family tree, so this information will be wonderful. Tammy, you can contact me at phunt0117@yahoo.com. I was the dj at 2001 night club in town & country plaza, in pensacola. Judy owned the hair salon upstairs from 2001. She often came to our day bar, the enterprise room, for happy hour. I came into work one evening and she was sitting at the bar. I said hello to her and the female bartender, jackie, and judy started yelling and cussing me out and saying men were worthless. She was drunk, obnoxious and scared the crap out of me. I was 19 yrs old. I just knew her as the hair lady upstairs that was a real b_tch. In 1983 I became a deputy in escambia county and vividly recall her murdering her son and bombing gentry’s car, downtown. I never forgot that mean, crazy, pissed off look on her face, that day in the bar. She truly hated men. It’s a good thing you didn’t piss her off or she might have gone after you! Stay away from women named Judy and Jodi! Friends and relatives recalled the car bombing lit up downtown Pensacola, FL. It happened at night. It was dark. After watching this on ID TV this woman was cold calculating and just plain evil!!! Some people do not know the entire truth about this case. They have the wrong date of execution and time. She did wrong in what she did, but get the facts straight. I was a very good friend of Kim’s in the 90’s, we worked together for many years and were close and spent a lot of time together. I personally don’t think Kim knew anything about what her mother did. Kim went on to marry and have a son of her own and was a very good mother. Kim was always helping people in any way she could and was kind hearted, the type of person who was always there for you if you needed her. I moved away from florida and haven’t seen kim in many years but I do know she was a wonderful person. From what I could learn by reading some old news articles written at the time of Buenoano’s execution, her surviving children believed she was innocent until the very end. I’m wondering if any of the people who knew the family personally knows if her children still believe she was innocent or if they were just supporting her while she was in prison because they knew she had no chance of a reprieve? The evidence in this case was overwhelming, despite her denials.